Modified Persona (Character) window for Fetish. This is basically a minimalistic version of the window to get the smallest version feasible while maintaining all original data and functionality. Backup your current version before copying this file to your FetishNightFall folder. 1.1 Modified progress bar size and text for faction and skills to be more legible. Hey, just wondering if you were planning on updating this for GU 60.... I'm not terribly fond of the size, layout, and excessiveness of the new one. Perhaps you could make the two new parts sliding trays, kind of like Zonx has the Stats set up? Plus the layout you have on this version, which I like much more. Sorry, I was not monitoring this feed. I will look at making it stand-alone. The issues will be some of the more compact elements found in the Fetish graphics library. However, it is possible to make them portable to any UI, it just requires some additional files like the .dds files and so on. Keep an eye out for the next version to be portable to other UI's. Is there any way this works as a stand alone? 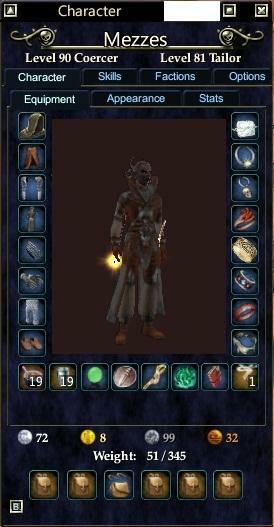 I don't care for the full fetish UI but I'd love to have this modification on the character window.